It is well-known that the major Canadian political parties now use political marketing tools to segment the electorate and target specific groups of voters. According to a new study, appearing in the journal Heliyon, published by Elsevier, positional issues play a greater role in Canadian electoral politics than previously assumed. Positional issues are divisive political issues for which there are different preferences. In contrast, valence issues are issues about which voters will usually share a common preference. An analysis of positional issues using multi-item issue scales demonstrates that many Canadian voters do indeed have strong opinions on issues, and that their effect on vote choice might even compare with those of conventional vote predictors, such as party identification. This finding provides new insights about how Canadian candidates and political parties can use political marketing tools to segment the electorate and target specific groups of voters. Canadian electoral politics have traditionally engaged in brokerage style politics, where parties avoid pronouncements on divisive issues that might exacerbate tense social cleavages. As a result, the parties end up competing on non-polarizing valence issues, such as the need for a strong economy and clean environment, and do not address the means by which these ends would be achieved, focusing on the “who” and the “what” rather than the “how.” One explanation for this electoral behavior is the heterogeneity of Canada’s socio-demographics and values where parties could easily risk alienating segments of the highly fragmented electorate. In contrast, positional issues are at the core of the dialog between citizens who share a perspective and political parties that target these citizens using micro-campaigns. Positional issues are idiosyncratic and difficult to evaluate across cultures and national and regional boundaries. This study differs from previous research because it considers aggregated opinions on related issues, rather than looking at each dimension individually. Using data from the 2004, 2008, and 2011 Canadian Election Study, researchers were able to create eight positional issue scales by grouping the responses to consistently worded statements answered at four-year intervals. The broad positional issue categories included the economy, environment, foreign/US relations, law and order, minority issues, moral issues, social programs, and women’s issues. The responses represented a spectrum of positions advocating free market economics and environmentalism versus more regulation, closer ties versus less engagement with the US, stronger social safety net versus program cuts, nationalism versus globalism, and flexible versus traditional values. 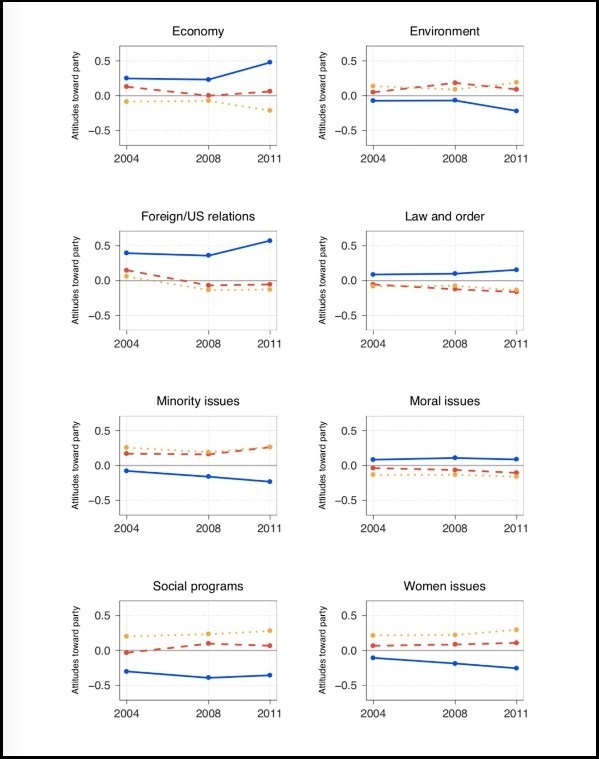 Evolution of the impact of positional issues on vote choice for each party from 2004 to 2011. The solid line represents Conservatives; the dashed line represents Liberals; and the dotted line represents New Democrats. These issue scales were used to compare the effects of positional issues to rival predictors of vote choice. The results show that conceptualization and measurement of positional issues through multi-items scales demonstrate both stability and significant effect on vote choice. The significance and strength of issues are found to be comparable to more conventional predictors of vote choice like values and party identification. “The more items in a scale, the more opportunities to capture citizens’ real attitudes,” explained co-investigator Catherine Ouellet. These results support the political marketing perspective that assumes voter preferences and party strategies have an impact on electoral outcomes. And because different positional issues do matter and affect different segments of the population, political parties have good reasons to engage in tactical actions such as direct mailing or wedge politics. Hence, the research shows that the actions parties take to capitalize on positional issues, as described by the political marketing literature, are justified. The article is “Conceptualization, measurement and effects of positional issues in the Canadian electoral context,” by Yannick Dufresne and Catherine Ouellet (https://doi.org/10.1016/j.heliyon.2019.e01453). The article appears in Heliyon volume 5, issue 4 (April 2019), published by Elsevier. In online coverage of this paper, please mention the journal Heliyon and link to the paper at https://www.heliyon.com/article/e01453. Heliyon is an open access journal from Elsevier that publishes robust research across all disciplines. The journal's team of experts ensures that each paper meeting their rigorous criteria is published quickly and distributed widely. Led by Lead Editor, Paige Shaklee, the editorial team consists of over 1,000 active researchers who review papers on their merit, validity, and technical and ethical soundness. All published papers are immediately and permanently available on both Heliyon.com and ScienceDirect.